Total knee arthoplasty (TKA) or total knee replacement (TKR) is a orthopaedic surgical procedure where the articular surfaces of the knee joint ( the femoral condyles and tibial plateau) are replaced. There is at least one polyethylene piece, placed between the tibia and the femur, as a shock absorber. In 50% of the cases the patella is also replaced. Reasons for a patella replacement include: osteolysis, maltracking of the patella, failure of the implant. The aim of the patella reconstruction is to restore the extensor mechanism. 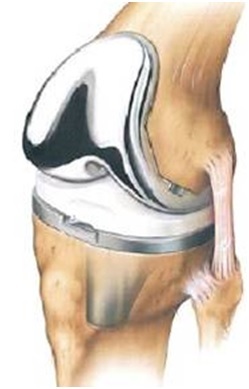 The level of bone loss will dictate which kind of patella prosthesis is placed. The main clinical reason for the operation is osteoarthritis with the goal of reducing an individuals pain and increasing function.. The Knee is a modified hinge joint, allowing motion through flexion and extension, but also a slight amount of internal and external rotation. There are three bones that form the knee joint: the upper part of the Tibia , the lower part of the Femur and the Patella. The bones are covered with a thin layer of cartilage, which ensures that friction is limited. On both the lateral and medial sides of the tibial plateau, there is a meniscus, which adheres the tibia and has a role as a shock absorber. The three bones are kept together by the ligaments and are surrounded by a capsule. When all the compartments of the knee are damaged, a total knee prosthesis may be necessary. The most common reason for a total knee prosthesis is Osteoarthritis . Osteoarthritis causes the cartilage of the joint to become damaged and no longer able to absorb shock. There are a lot of external risk factors that can cause knee osteoarthritis. For example: being overweight; previous knee injuries; partial removal of a meniscus;  rheumatoid arthritis; fractures; congenital factors. There might also be some genetic factors the contribute to the development of osteoarthritis, but more research is necessary. Total knee arthroplasty is more commonly performed on women and incidence increases with age. IN the US in 2008 63% of TKR operations were on women. Also a dramatic increase in TKR surgery is projected to occur with a 673% increase by 2030 in America.. Another trend for TKR surgery is the increasing rate of of recipients under 60, whilst initially designed as an operation for the >70 age bracket. Pain is the main complaint of patients' with degenerated knee joints. At first, pain is felt only after rest periods ( this is also called ‘starting pain’) after a couple of minutes the pain slowly fades away. When the knee joint degeneration increases, the pain can also occur during rest periods and it can affect sleep at night. Individuals' can also complain of knee stiffness and crepitus. Due to pain and stiffness, function can decline and is manifests as reduced exercise tolerance, difficulty climbing stairs or slopes, reduced gait speed and increased risk of falls. Complications as above may require joint revision surgery to be performed. These are the different stages of osteoarthritis that you can see at a MRI. First the examiner should ask the patient about the history of complaints and also about expectations from surgery. Inspection: of the wound/scar, redness, adhesion of the skin. When infection of the wound is suspected the patient must be referred to an orthopedist or an emergency doctor. The purpose of the surgical procedure is to achieve pain free movement again, with full functionality of the joint, and to recreate a stable joint with a full range of motion. Total knee arthroplasty is chosen when the patient has serious complaints and functional limitations. Surgery takes some 60-90 minutes and involves putting into place a three-part prosthesis: a part for the femur, a part for the tibia, a polyethylene shock absorbing disc and sometimes a replacement patella. A high comfort insert design is chosen to achieve this. The perfect prosthesis doesn’t exist; every prosthesis must be different and the most appropriate size and shape is chosen on a patient by patient basis. During surgery a tourniquet is sometimes used; this will ensure that that there is less blood loss. However, when a tourniquet is not used, there will be less swelling and less pain. The physical therapist can choose to teach the patient the exercises before surgery in order that the patient might understand the procedures and, after surgery, be immediately ready to practice a correct version of the appropriate exercises. It is also important that the functional status of the patient before surgery is optimised to assist recovery. The focus of a pre-operative training program should be on postural control, functional lower limb exercises and strengthening exercises for both of lower extremities. Unfortunately, there is limited evidence to support that pre-operative physiotherapy brings significant improvements in patient outcome scores, lower limb strength, pain, range of movement or hospital length of stay following total knee arthroplasty. Evidence indicates that physiotherapy is always beneficial to the patient post-operatively following total knee arthroplasty. Although specificity of intervention can vary, the benefits of the patient actively participating and moving under physiotherapists' direction are clear and supported by the evidence. There is also some low-level evidence that accelerated physiotherapy regimens can reduce acute hospital length of stay. ↑ Palmer, Simon H., and M. J. Cross. "Total knee arthroplasty." Available on http://emedicine. medscape. com (ultimo accesso: 15 maggio, 2009) (2014). ↑ Kloiber, J., E. Goldenitsch, and P. Ritschl. 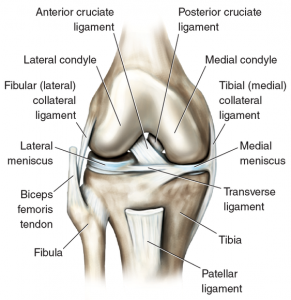 "Patellar bone deficiency in revision total knee arthroplasty." Der Orthopade (2016). ↑ Skou ST, Graven‐Nielsen T, Rasmussen S, Simonsen OH, Laursen MB, Arendt‐Nielsen L. Facilitation of pain sensitization in knee osteoarthritis and persistent post‐operative pain: A cross‐sectional study. European Journal of Pain. 2014 Aug;18(7):1024-31. ↑ 5.0 5.1 Blagojevic, M., et al. "Risk factors for onset of osteoarthritis of the knee in older adults: a systematic review and meta-analysis." Osteoarthritis and cartilage 18.1 (2010): 24-33. ↑ Etiology and Surgical Interventions for Stiff Total Knee Replacements. ↑ Lee, Qunn Jid, Wai Ping Mak, and Yiu Chung Wong. "Risk factors for peri-prosthetic joint infection in total knee arthroplasty." Journal of Orthopaedic Surgery 23.3 (2015). ↑ Polat, Ceylan, Sayar, Kucukdurmaz, Erdil and Tuncay. "Effect of body mass index on functional outcomes following arthroplasty procedures." World Journal of Orthopedics. 6.11 (2015). doi:10.5312/wjo.v6.i11.991. ↑ Jakobsen, Thomas Linding, et al. "Early Progressive Strength Training to Enhance Recovery After Fast‐Track Total Knee Arthroplasty: A Randomized Controlled Trial." Arthritis care; research 66.12 (2014): 1856-1866. ↑ 11. Vigdis Schnell H., Olav Andreas F., Otto Schnell H., Siri Bjorgen W. "Randomized controlled trial of maximal strenght training vs standard rehabilitation following total knee arthroplasty." Journal of physical and rehabilitation médicine (2017).